Several measurement schemes can be used for optical sensing depending on the exact application and conditions. Basic measurement technique includes one LED and one photodiode. 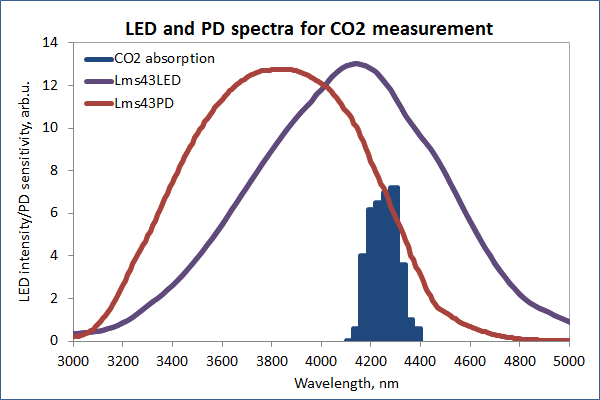 The LED emits radiation at a specific wavelength that corresponds to the absorption band of the analyte, the spectrally-matched photodiode detects it and puts out an electrical signal. Presence of the analyte in the environment between the LED and photodiode causes attenuation of the photodiode signal and, dased on the level of attenuation, it is possible to estimate the concentration of the analyte. This technique is used in most of our evaluation systems and sensor modules. - monitor intrinsic LED temperature judging by LED current-voltage dependence. Our standard electronics (D-51 LED driver and electronics used in on-board sensor modules) enables this option and puts out signals that carry information about the temperature changing. These signals can be used for the further arranging of the temperature compensation. This scheme includes an additional PD apart from a measuring LED-PD optopair. The additional photodiode is a reference one and is introduced in order to compensate influence of irrelevant effects unrelated to the analyte absorption. 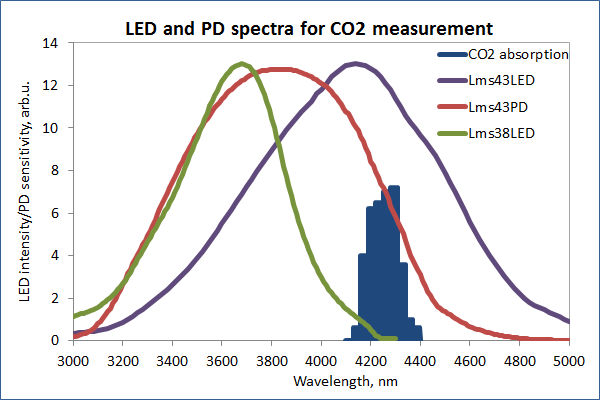 Measuring photodiode provides the measuring signal sensitive to presence and concentration of analysed matter, while signal from reference PD remains practically unaffected. Processing of measuring and reference signals allows obtaining stable and reliable measurement results even in harsh temperature and environmental conditions thanks to the fact that photodiodes react in the same manner to the external conditions. b. reference PD has a spectrum insensitive to a given analyte and is deposited close to the measuring PD. This scheme should include an LED with a spectrum broad enough to provide the emission for two photodiodes with different wavelengths - measuring and reference or two similar photodiodes with additional optical filters to differentiate measuring and reference wavelengths. This technique includes an additional LED apart from a measuring LED-PD optopair. Measuring LED emits radiation at wavelength corresponding to the maximum absorption of the analyte. Reference LED emits at wavelength that is not absorbed by the analyte. 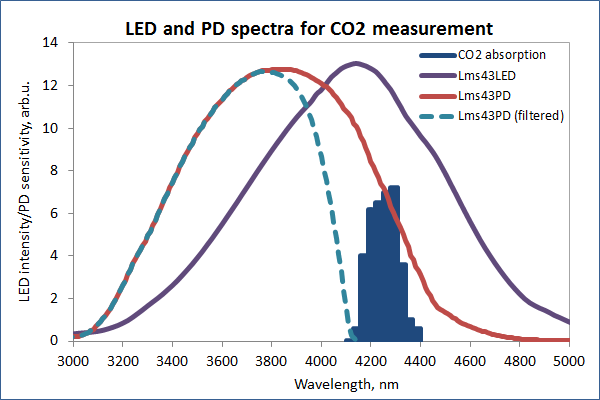 Signal difference between the measuring LED that is partially absorbed in the optical cell and the reference LED is proportional to the concentration of the analyte. This approach is similar to the previous one with the only difference that additional photodiode is introduced for reference signal detection. 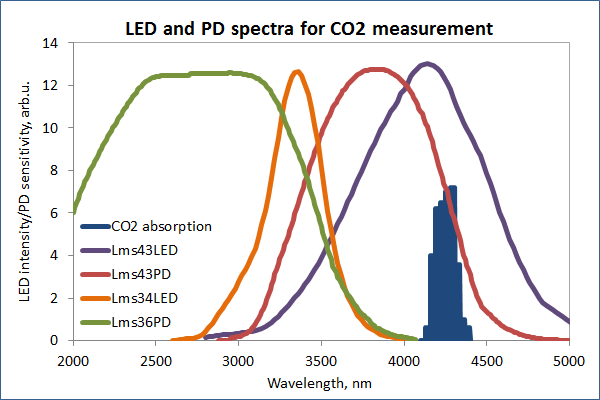 The overall scheme includes 2 independent channels: measuring LED-PD optopair (corresponds to the absorption wavelength(s) of the analyte) and reference LED-PD optopair (operates at wavelength(s) away from the analyte absorption). Concentration of the analyte is defined by the signal difference between the measuring and reference PDs.